Nene Raju Nene Mantri Theatrical Trailer: The makers of Rana Daggubati starrer Nene Raju Nene Mantri Movie theatrical trailer Released the 1:22 sec trailer indicates that the film will be another captivating flick in Rana Daggubati’s career. Puffed with powerful dialogues, Nene Raju Nene Mantri seems to be filled with some exceptional scenes. Rana Dagagubati, as a politician, keeps one gripped to the screens and leaves you asking for more. Interestingly, actor Navdeep has been accepting non-lead roles lately which gives out a great message to actors in the industry. He has shared screen space with the likes of Ram Charan, Allu Arjun, and Jr NTR in the past and seems pretty happy taking up these kinds of roles. Directed by Teja, Nene Raju Nene Mantri also features Kajal Aggarwal as Rana’s love interest and Catherine Tresa in an important role. The cast also includes Ashutosh Rana and Navdeep who play some pivotal roles in the film. Nene Raju Nene Mantri is produced jointly by Suresh Daggubati, Rana’s father, and CH Bharath Chowdhary and V Kiran Reddy under Suresh Productions and Blue Planet Entertainments. 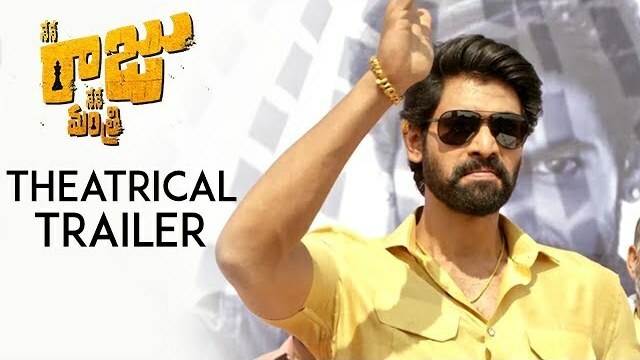 Tags: Nene Raju Nene Mantri Theatrical Trailer, Nene Raju Nene Mantri, Nene Raju Nene Mantri Trailer, Nene Raju Nene Mantri Movie Trailer, NRNM Trailer, #NRNMTrailer, #NeneRajuNeneMantri, #NeneRajuNeneMantriTrailer, Catherine Tresa, Rana Daggubati, Kajal Aggarwal, Rana Nene Raju Nene Mantri Movie, Nene Raju Nene Mantri Telugu Movie, Rana Daggubati Latest Movies, Kajal in Nene Raju Nene Mantri Movie, Latest Telugu Movies, Latest Movie Trailers.